Meaningful shapes, colors and symbols: Silver and black waves with a red label with three points. 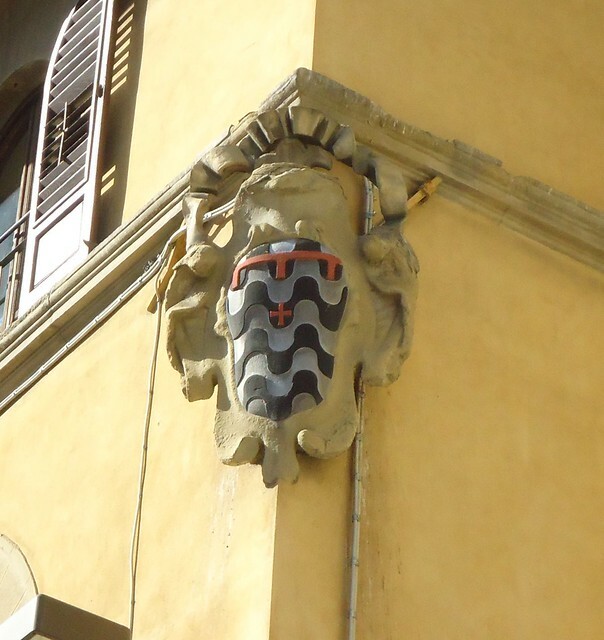 Where to find it: In Piazza Pitti, across from Palazzo Pitti. The Pitti are an old Florentine family and were the original owners of Palazzo Pitti. The Pitti family became involved in banking and were very successful, making them influential in Florentine politics. In 1458 Luca Pitti gained control of Florence on behalf of the sickly Cosimo de' Medici, an act for which he was ennobled. The Pitti family continued to live in their Palazzo during the time of Savonarola, but were forced to sell the property to the Medici in 1549 due to financial constraints.